There will be beer festivals in Denmark this year as well, but not on the massive scale of last year’s event at the old Carlsberg brewery. 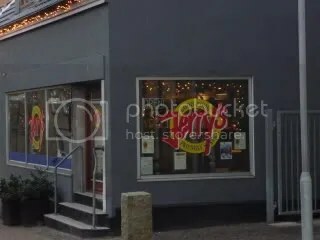 They will return to Valbyhallen, a venue that has been used often over the years. The dates are 15-17 May, which is not convenient for me, but I’m sure there are beer lovers across Europe who are booking their flights and hotels already. Check www.ale.dk. Tickets are on sale next week. And, in case you were worried that the recession has taken its toll, there should be plenty of beer. There are already 150 new Danish beers launched in 2009! And if you cannot make Copenhagen, there is a smaller event in Esbjerg in October. The Danish Beer Enthusiasts are running a poll on the best new beers of 2008. Have a look at the ten finalists at Beerticker.dk. I tried the two Djævlebryg beers at the Copenhagen Beer Festival. Amazing stuff. It is interesting to note that there is a canned beer among the ten, and that is even a beer that is being aimed at the discount market – 24 cans for 100 DKr. According to Peter Myrup Olesen, who has compiled the numbers, the rise is not likely to continue, so 2008 is probably the top. 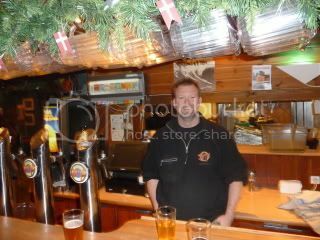 If your read Danish, he has just started a blog that has ambitions to be truly comprehensive when covering the Danish beer scene. Try Babelfish if you are really curious! One of the things I love about the online beer community is that many have found their own niches. Sure, we want informed writings about particular beers or pubs and rants about taxes and the stupidity of the big players in the business. But we are also lucky to have people willing to devote their time to document, either the present or, as in blogs like Ron’s and the Zythophile’s, the past. Cheers to those who actually do some work here, while some of us is only in it for, well, the beer! During the summer, this is the gateway to Jutland for ferry-loads of Norwegians and Swedes. Year round it is a destination for those who take the overnight ferry from Oslo, with two hours for shopping – meat and booze mostly. In this pre-Christmas season, most of the passangers seem to be either sleeping it off or still partying, there are rather few of us who queue up to get off at seven thirty. We get off and the first stop is the breakfast buffet at Damsgaard supermarket. The shop itself has seen better days, but the cafeteria is still good value for money. Before I sit down with my coffee and rolls, I make a phone call. There is aa new attraction in town for a beer hound – one of the restaurants has started brewing its own beers. I e-mailed them last week, and the manager gave me his mobile number. They are only open in the evening, but he told me we’ll work something out. I call, and he tells me he will be in the restaurant in five minutes. This being a small town, so I agree to meet him there. The door to Jerry’s restaurant is open, and Erik is the man behind the bar. He greets me warmly, and he is pleased that there are people interested in what he is doing. He emphasises that he does not consider himself a brewer. His main beers are not aimed at beer connoisseurs, either. They are simply beers aimed at the pilsener market. The pale ale is rather similar to a pilsener, but the top fermentation means that he can cut down on the conditioning period. The red ale is similar to the Danish Classic style, with some more malty sweetness and a darker color than the pilsener. The restaurant has been running for 17 years, while the brewing only started this year. He had the big advantage of having an established bar/restaurant and knowing exactly how many thousand liters of beers he sells in a year. This made it possible to set up a more realistic business plan than many others who start both the pub and the brewing at the same time. So far, he has mainly followed the recipes form the company that delivered the brewing eqipment, Fleck’s Brauhaus Technic in Austria. He tells me they also delivered the equipment to Lillehammer Bryggeri, and when I look them up, I find that they also are behind the Pri Kmeta brewpub in Sofia, which I visited last year. I addition to the advice from the Austrians, Erik also relies on the advice of an experienced home brewer, who knows how to adjust the settings to get the desired results. I try both the pale ale and the red ale, and, while not outstanding, they are pleasant beers that can be consumed in quantity. The recipes will be adjusted from the next batch. The pale ale will have a more pronounced hoppiness in the finish, and the red ale will have more body and color. In addition to the two standard beers, there will also be a rotating seasonal beer , and this will be more experimental. Erik was rightly proud of his Christmas brew, a dark beer at 5.1% ABV with a strong anise aroma. The flavour reveals even more spices, it is brewed with star anise, cardamom, cinnamon and other Christmassy spices. This blend well with the dark beer base, with a malty full body. I don’t usually taste beers at eight in the mornig, but this was a very pleasant experience. I promise to be back to taste his improved beers the next time I am in town. There are two boxes with bottled beers on the counter, and I ask if I can buy them to take away. Erik insits on giving them to me as a present, and I won’t argue with that. Then it is off into the frosty winter morning again, but is doesn’t seem so cold any longer!